So you want to make a theme for Magento? You picked a tough gig, Chap. When I first began learning Magento 1.6, I found a lot of outdated or downright wrong information on the right way to create a theme. So I made mistakes. A lot of them. And then I promised myself I would create a (3,000 word) tutorial to help others and spare them the headache. So consider this your all-inclusive guide to Magento 1.6 theming: from the installation to a finished product. This guide will use Ubuntu as the operating system of choice. If you aren’t running a Linux distribution, you may run into some problems that won’t be covered in this guide. Did you know Ubuntu was free? Get it here and run a dual boot, or even run it as a virtual machine. Let’s create the Magento directory we will be working in and then download the project via Subversion. It’s possible the above URL will change. A minor release may come about or the branch will be moved. In that case, you may find details you need on the Magento SVN page. Magento uses MySQL for its database. You will need MySQL installed and change out the username to fit your own. I’m using a super user, so in your case you might have to create your own Magento user and assign privileges accordingly. We will be accessing the project through the http://magento.local/ path. First we tell Ubuntu to redirect any traffic to that domain to our localhost, then setup Apache to handle the request. Now create a virtual hosts file that tells Apache how to handle our request. 000-default is probably already in your Apache2 folder. If you don’t have any other vhosts setup, you’ll want to create 001-magento. Restart Apache and check it out! If things went well you should see the install. The install process is simple, so let’s skip to setting Magento up for development. Developing on Magento is a pain if you are using the settings for the production environment. Let’s make development easy on ourselves! Check the owner of the files, and recursively use chown if necessary. It’s fantastic that Magento comes with the ability to cache everything and anything, but this is poor for development. Save yourself from clearing the cache on each change by disabling it completely. There are two main parent directories that will be used to run a theme. /app/design/frontend/ – This contains all the logic and markup for your theme. Look around a bit. There are a lot of files! It may seem easier to copy an existing theme and hollow it out to make your own. This is a bad idea: there will be quite a bit of excess code, and you won’t learn the Magento theme structure as you should. Before we get started, a word of caution: never edit the base package. 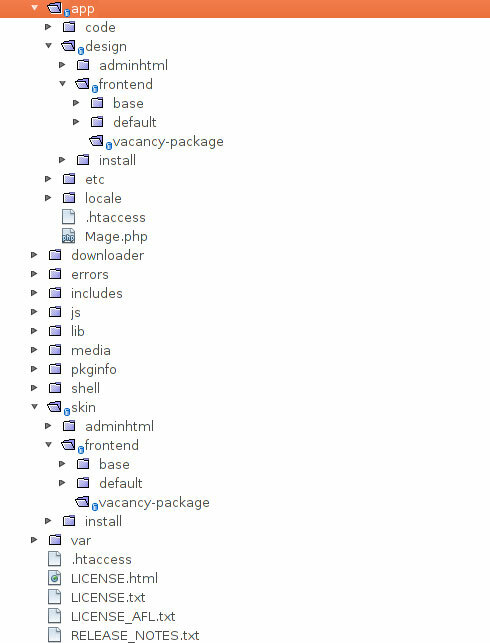 It contains all the fallback files that are used when Magento can’t find a certain file. In addition, a Magento update will overwrite changes to the base package. You may have multiple themes for each package. 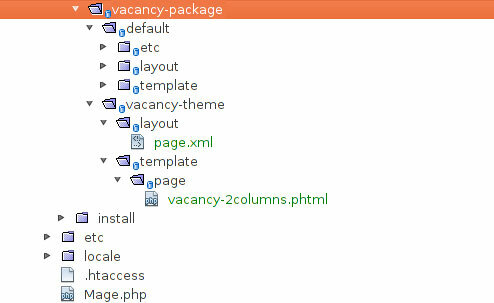 Our package will actually have two themes: default and vacancy-theme. The base package works as a great fallback, but we will be copying the default theme to our own package. Then we won’t have to touch any files that aren’t pertinent to our project. Excellent. 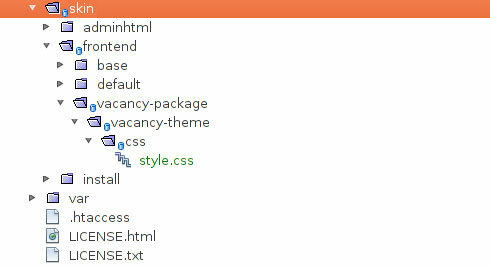 Now if Magento can’t find a file, it will use our package’s default theme to find it. Just like the base package, you shouldn’t edit this theme. No need to copy over your styles and images: we will be using our own basic design for this tutorial. Magento doesn’t yet know we want to use our own package and theme — let’s tell it! Refresh the home page and you will see an un-styled beast of a theme. Let’s get Vacancy styled, shall we? Alright, maybe not high end, per se, but for our purposes it will explain the concept of themes famously. You won’t directly use the index.php file, but you should still take a good look at it. It gets chopped up into sections, modules, and blocks before we are able to use it in our actual theme. We are concerned with the layout and template folders. Layout contains the XML files, while the template folder contains PHTML files. The XML files structure the content by blocks, while the PHTML files contain our actual markup. This should be more clear when we work with these files more. /layout/page.xml – This contains the mentioned structural code. Our own page.xml will be drastically simplified. /template/page/2columns-left.phtml – This contains markup for one of the default layouts, which has two columns and a left sidebar. As you can see, Magento simplifies the layout to a great extent by allowing for blocks and sections to be included as needed. It’s a good time to review blocks. In Magento, blocks serve the purpose of grouping together items in your template. In our case, our blocks are the head, header, sidebar, content area, and the footer. You will notice that the root block references a template file, vacancy-2columns.html. Let’s create that now. For now just put the contents of our index.php file you downloaded earlier and save it. In the dropdown to select the design for the homepage you will note our theme and package is there, but our layout isn’t. The dropdown is being populated by an XML file so it isn’t dynamic. And now more bad news: editing this dropdown isn’t as easy as you would think. There are two methods of altering your CMS page layouts. Creating a module is the accepted way, but by simply making a module we won’t be able to remove the base layouts from the list. Not a big deal, but for the OCD impaired it’s sure painful. Extending a core Magento file is the second way, and it has the benefit of giving you full control of what is in the list. The problem is that we are extending a configuration file — this is generally looked down upon because upgrades might significantly change the file. That means work will have to be done to update your installation before upgrading. This is somewhat a non-issue: if you have extended core files, you should already know that you’ll have to take a look at them before upgrading. We’ll go through both methods since they both teach valuable lessons. Afterward you may decide which you want to side with. Magento keeps it’s base code in /code/core/Mage/. Do not ever modify these files directly. Your changes will be overwritten when you upgrade Magento. Instead, we have to extend the core files. We don’t actually modify system.xml. Since there will be no fallback, we have to include all original files whether we modify them or not. Refreshing the homepage, you should see that we are now using the new layout. The CSS shouldn’t load correctly at this point. We’ll get to that after reviewing the second method of changing CMS layouts. Creating a module is easy. We create a new XML file in /etc/modules/ named Vacancy_CMSTemplates.xml. Looking good! It’s also worth noting that if you wanted to quickly disable your changes, you could disable the module in the admin panel instead of removing your code. Oddly, the list of modules is conveniently dynamic! Hmph! .. and that’s a wrap! As for me, I’m fine sticking with the extension method. So far we only have a static layout. And one without style, no less. Let’s set up different files for the header, sidebar, content area, and footer. The /html/ folder will house three of the key template files for pages. Nothing here to change. Remember our page.xml layout block where we added the CSS file? That gets called with the getCssJsHtml helper. Automatic handling of meta tags is nice too. For the sidebar we use a Magento helper to load all the categories and then loop through them, displaying them one at a time. If you want to learn more about helpers like getName, your best bet is to get the class name of the object and search the Magento docs, or to do some sleuthing yourself. 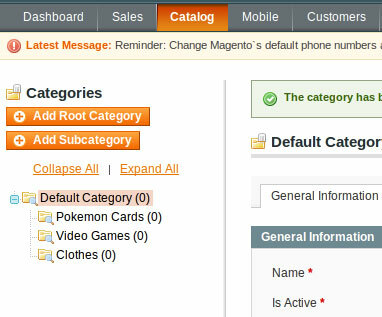 ["name"] => string(13) "Pokemon Cards"
You’ll be diving into code like this often with Magento: the official and community documentation is often outdated or just not helpful. The footer also contains dynamic content. We will introduce the concept of Static Blocks in this section. A static block is a block that can be edited within the administration menu. In our case we will make the footer links easily edited. Magento has already created our footer static block for us. You may see them if you go to CMS -> Static Blocks. The syntax for getting a block from the CMS menu is easy. If you want to include a different block, just switch ‘footer_links’ with the block identifier, which you set in the edit menu for the block. Now let’s bring it all together. Our template file will piece all of the phtml files we just created together. So this is fairly simple. With getChildHtml we are simply telling the layout to find the block within quotes. If you look at your page.xml file you will see that the names here correspond to the names of each block we created. This is a rather long tutorial already, so we’ll stop at this point. The first thing you should do is become more familiar with the administration panel. Change the Homepage CMS template to show text, look at configuration options, and explore as much as possible. Next you’ll want to create templates, layout configurations, static blocks, and anything else you want to add to the theme. If you have browsed a category page by now , it wasn’t a pretty sight. You now have the time-consuming task of learning every layout file that Magento uses and properly configuring them for your needs. A fair warning: the Magento community gives bad advice sometimes, or it’s extremely outdated. From here you absolutely must tinker with the code and experiment by yourself, in addition to asking for help on StackOverflow, #magento on Freenode, or asking directly here. Note that the Magento forums are usually fairly dead and you are unlikely to find answers there. I made this guide as complete as I thought possible. Please comment on things I should add if you hit a stumbling block. Good luck, and godspeed in your Magento endeavors! hard to find documentation all in one spot like this. thanks a lot. you write like a shekshpear. you have not given the final form of vacancy-2columns.phtml. As per your tutorial it index.php is copied to it. You are correct, Ramki. A redditor on the Magento subreddit brought this to my attention Friday and I haven’t updated it yet. Will do so tonight. Thanks for the feedback! Cheers. Thanks for a great intro tutorial, it’s true that’s very hard to find concise and accurate help on Magento 1.6. Are you able include a zipped package of the /app/ and /design/ files used in this tutorial? Great tutorial – there’s not much 1.6 tutorials out, thanks again! Finally a 1.6 tutorial that isn’t a copy and paste of 1.4 without testing. Great blog piece Zachary, haven’t seen anyone strip Magento down and start again from scratch like that. I find that copying the theme and modifying in my own Package suits my needs, but your method is a great way to actually understand what’s happening behind the scenes. Thanks for the kind responses everyone! @Ken – That’s a good idea. I’ve updated the post with a link to a zip file that contains the /vacancy-package/ folder in /skin/ and /app/ – hope this helps and thanks for the suggestion. Hi, Thank you very much for this tutorial! I was able to successfully create my very first theme painlessly the first time I did this. Now, I have tried to modify this theme but I cannot add pictures (site logo, crumbs, png/gif files) no matter what I try … what am I doing wrong? @Farrenzo – This is by no means a completed theme. You will have to look at the default theme to use methods to get items you need. In the case of the logo, you should look at the template file for the head. It contains a method to get the logo, as set in the backend. 1. Make sure the new categories are under “Default Category” or they will not show up. Great tutorial, thanks for sharing. The only issue I had was with the sidebar.phtml – the code that echos the category URL should be “echo $this->getCategoryUrl($cat);”, not “echo $cat->getCategoryUrl($cat);”. The latter was empty for me. That was something I was looking for. One well written ad as described All Inclusive guide. It was like treasure at the end of hunt for someone newbie like me…thanks a lot mate !! and hoping to see lot more articles on Magento 1.6 here.. It is one of the great tutorial I found. However I am not able to add the product in the shopping cart also the theme is not going to apply for the “add to whishlist” and “forgot password” etc…. Can anyone help me to understand where I am wrong? My above problem has been solved.However, One page checkout page in not working for this cusome theme. Can any one help me in this? An error occurred while saving this configuration: package with this name does not exist and cannot be set. I tried your “Method 2 – Creating A Magento Module”. But my custom module dose not shown in the system->Configuration–> Advanced. Help! Thanks for your good tutorial. 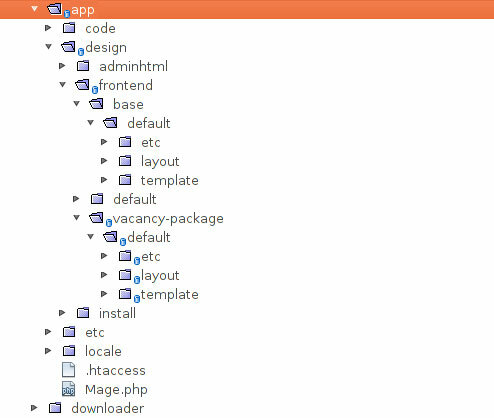 However, when I try to write my own template/page/home.phtml, magento does not use this file and use its default phtml. The new Layout appears in custom Layout and in sys/config/advanced/advanced modules. @myu and Mahsa: Did you download the ZIP file? I would suggest looking at it and doing a diff of what you have. That’d be the easiest method of finding the answer. Just what I needed, nicely written. CSS is not loading, I made some mistake, but hey, thats learning! And even after copy pasting your files from the zip file below, I still cant select it. Is it me, or is there some sort of cashing in volved? I have to admit, I’ve been looking all night for a decent Magento theming tutorial and I think I’ve just found one! Thanks a lot dude! Awesome tutorial: well-written and easy to understand – would love to see some more along similar lines! Great job! I think the folder path should be “/app/design/frontend/vacancy-package/vacancy-theme/template/page/html/” and in fact you use that path just below – I think the first path where the word “template” is missing is just a typo. Might cause confusion, though! Well done again – keep up the great work. @Tx3 – Many things could be wrong here. Could you by chance zip up your full installation and send it to me? Use my contact form to ping me, I’ll send you an email back. @Maff – Well spotted! Thanks very much for your attention to detail. I’ve updated the article; you were correct. Very Nice tutorial! You explained theming very clearly. Thanqs a lot.. It would be useful to enable dates on comments. I can’t see what order or how old they are. This seems to be working for everyone else, but I canoot get this thing to work for the life of me. I’ve spent hours. Under “Enabling The New Package and Theme” are we changing the Defualt Config, Main Website, or Main Website store? My site is a mess. You need need to reload your package after installing the extension method, else it doesnt work for me. You are a king among men. Well done. I tried following first method ( changing magento code) n magento community edition 1.7, but unfortunately, the layout could not be seen in the drop down ( in home page design – under cms, pages). I followed all the steps you had mentioned multiple times. Hi Nishi. This article is a version before 1.7, so unfortunately something must have changed since then. I’ll be writing a guide to theming 1.7 within a month or so. Sorry I’m not more helpful! Correct, AJ. I’ve updated the article, thanks so much for taking the time to let me know. Great tutorial. I would like to include a custom php script that needs to be called before the head section. I have created the custom module and config.xml files, but I’m having trouble calling the block right before the head section (the module works fine if I call the block from within the CMS). Great Tutorial! very helpful for a start. Everything works on 1.7, I don’t know why someone had a problem with that. Excellent work on putting this tutorial together. There aren’t many good ones out there! 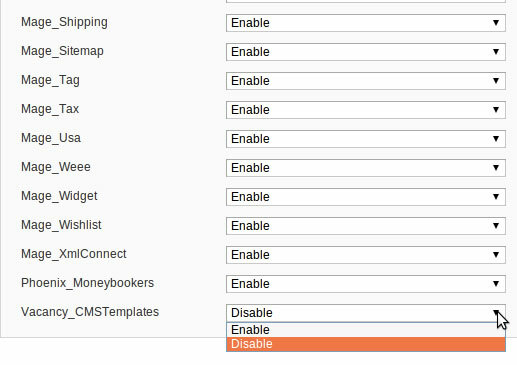 For anyone having an issue selecting the new custom layout in the CMS, try refreshing or clearing the Magento cache first. Go to System -> Cache Management. Nice work to document all this. Unfortunately I am using the module method for setting template layouts, and can’t get the layout to show up in the CMS > Pages > Home Page > Design section, or in the Advanced module listing. I’m using 1.7.0.2. Any incompatibilities that you know of? Going mad trying to figure this out, any insight appreciated. Great tutorial. Couple of issues, but a quick read through the comments sorted me out. Everything works (aside from editing magento core). Would you mind updating the tutorial for 1.7? Extension thingy doesn’t work, as someone already mentioned. I worked out the tutorialin magento 1.7.0.2 and it works great, including the extension and modules part. Make sure you edited the Mage_All.xml file asking magento to use local codepool and not the core. Please do double check for typos. Awesome tutorial Zac! I greatly appreciate your efforts 🙂 Thank you! Besides being a very good, well-structured resource I also very much like your writing style. Quite entertaining and keeps one reading. Kudos! Boss what have you done? I mean,after long hours & days of frustration when something like this come up, one just feel he has got everything.I am just feeling that right now. This has to be the best & probably the only complete tutorial on magento theme development that I have come across.Thanks a ton. Thanks a lot. This sure is the one and only working tutorial. Great stuff! This is a nice tutorial. But there is something which you might want to include. If you do a custom theme it is considered good practice to use one ../design/../../../layout/local.xml in which ALL changes are made. This file is always loaded last and all changes overwrite all previous changes. So if you do changes in an .xml file you do it only in local.xml never copy .xml files from the default directory. This is easier to maintain, because everything is in one place. There is no such directory from the root. So if like me the first time you created this then it does not work. The file Vacancy_CMSTemplates.xml should actualy be in /app/etc/modules/ and then it all works just fine. I’m planning to follow this tutorial, it seems to be the best one on the web, but I’m going to use Magento 1.7.1. Do you think it’s a good idea to start getting more familiar on theming with magento 1.6. Or is it such a big difference on theming between Magento 1.6 and 1.7.1 that it should better to start with 1.7.1? Thanks a lot for creating this tutorial, respect! I just want to say thank you. The documentation on magento is rubbish and outdated. I tried 10 different ways to make a theme out of this design I created for a client and failed 12 different ways. This one worked. 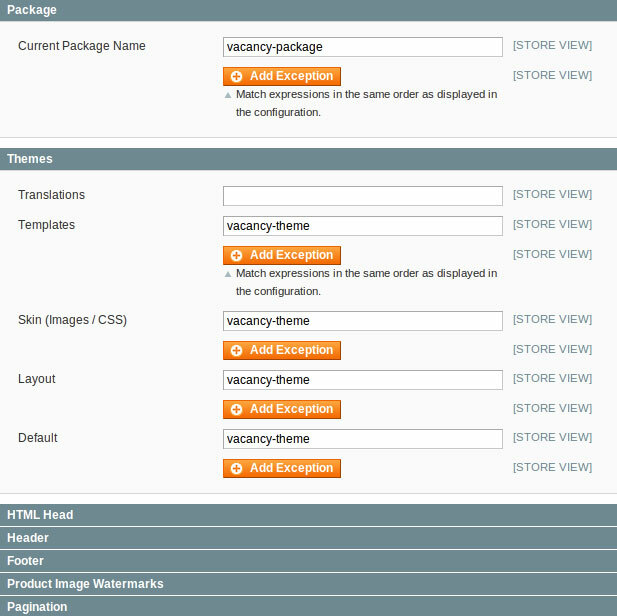 My theme is far from complete, but at least I understand what Magento is expecting and know how to make it work for me. one of the best guides on themes on the net for Magento. Great Stuff !!! Thanks for such an elaborate yet simple guide. I also faced some issues with the extension and the module thing in v1.7, but once you refresh the Magento Cache Storage Management, its all fine. Thank you for the tutorial. It give me a nice Kick off for Magento theming and have save me a lot of time! I found you tutorial very much concise, upto the point and very helpful.I didn’t see any tutorials like yours before this. It helped me a lot. Thanks one more time mate! This is a seriously good guide, thanks for sharing. Your process and explanation is great. Brilliant, I have always avoided Magento because of what i consider its steep learning curve, this post has made sense of the basics, once you grasp the basics then the rest falls into place as a matter of course.. Top Marks to you sir!